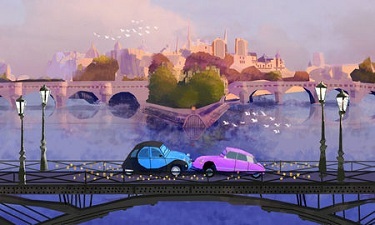 From the early pencil sketches and conceptual artwork to the storyboards, color scripts and character designs, the gorgeous Art Of Cars 2 volume celebrates the artistry and imagination behind Lightning McQueen and Mater’s most brilliant racing adventure to date and casts a unique light on the always-incredible work of The Lamp! After co-creating and executive producing the Fox television series Drive Cars 2. 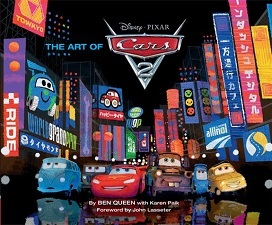 So who better than Ben than to guide readers of The Art Of Cars 2 through the exploration of the art and story development behind this fast-paced, international adventure? 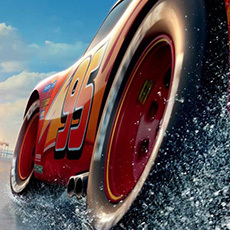 Animated Views: How did you become the writer of The Art of Cars 2? Ben Queen : Someone in publishing thought of me for it, apparently. 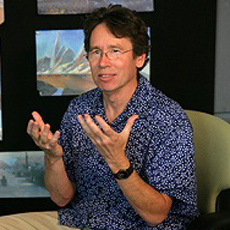 They believed that getting the perspective of the film’s screenwriter could add a different dimension to the “Art of” books. I was honored to be asked and jumped at the opportunity to do it – mostly because it allowed me to learn the Pixar process in ways I hadn’t been privy to up to that point. As the screenwriter, I spent most of my time with the director, co-director, story team and editorial. 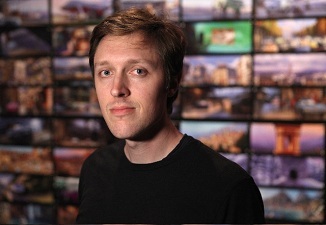 But hearing how the brilliant artists and technicians at Pixar created the stunning look the film? That was something I was excited about – learning how it really works here. AV: How did you get to work with Pixar? Is it because of the connection with Drive? BQ: Strangely enough, nobody at Pixar had seen Drive. (Actually it’s not that strange – the show was cancelled pretty quickly.) No, it was an original screenplay I’d written that caught the attention of the studio. Believe it or not, I’m not really a car buff. I couldn’t tell you where the carburetor of my Prius is located. I don’t even know if a Prius has a carburetor! But I’ve always been interested in how cars say something about the people that drive them. In ‘Drive’ the vehicles for the characters really had to externalize the characters, had to give an instant impression of who they were. For instance, a soccer mom drove a minivan, a father and daughter were in a Taurus. 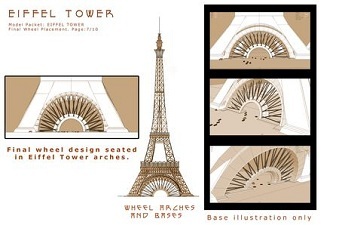 Cars 2 obviously takes this idea much further in that the cars are the characters. AV: How would you describe the screenwriting process at Pixar? BQ: Very collaborative, very fun. The pendulum of discussion swings equally between plot and character. And they’re big believers that writing is rewriting. As Andrew Stanton likes to say “Get it wrong as soon as possible” (I’m paraphrasing). They like to get an entire movie written quickly – then the real work begins. AV: Would you consider the screenwriting process different because the movie is animated or is it the same as in live-action or TV series? BQ: It’s exactly the same, except that there’s greater leeway for failure. In television you can’t just scrap an entire episode and start over thirteen times. Well you can I suppose, but that wouldn’t keep you on the air very long. You really get a chance to be meticulous with your work. This is best exemplified in the voice recording process. When we do a session with an actor – Michael Caine for instance – we can do ten alternate versions of the same Finn McMissile line. Same idea, different lines. And there you’ve got ten different versions of the scene. In TV it’s hard enough to get one line perfect. But for me it doesn’t matter what medium it is, I’m still starting alone in a room with a blank page. AV: What is the relation and what are the differences between the screenwriting part and the story(boarding) part in the creation of the story of Cars 2? AV: How did you go from Cars to Hitchcock’s Man Who Knew Too Much (or vice versa)? BQ: That was John Lasseter’s idea. When they came to me with the idea, it was already being described that way. And I think that’s the smartest thing they ever did and what makes Pixar so special. I defy you to find a sequel, especially a big budget animated family sequel that changes tone and genre so dramatically. It’s gutsy – shows a real confidence in vision. I believe I touch on this in the book, but most Pixar sequels genre shift in one way or another. The first Toy Story is a buddy film; Toy Story 2 is a rescue film; Toy Story 3 is a prison break film; They all live in the same tone, comedically. But they’re different genres nonetheless. Cars 2 does the same thing, but more dramatically. If I were a kid, for instance, and I’d seen the first Cars a hundred times (which was a ‘Coming of Age’ movie) and fallen in love with that world and those characters and then walked into Cars 2, which turned it into a spy action movie? I think I would lose my mind. AV: It’s interesting a screenwriter writes a book on art. In the creation of the story and visual aspect of Cars 2, how would you describe the relationship and/or collaboration between the writers and the artists? BQ: Mostly, and I’m not trying to be humble here, but mostly the collaboration consists me simply writing something that comes into my head whereas the artists then must build images from the ground up over a period of months and sometimes years with mathematical attention as well as playful whimsy. It’s awe inspiring to watch. For instance, the scene where Mater has to go into the Japanese bathroom and doesn’t know which door he should choose. My description in the screenplay read: “Two bathroom doors, neither of which clearly indicate male or female”. That’s just something I always thought was funny – how bathroom doors in foreign countries can be flummoxing – so I put it in the movie. Now the art department came up with two doors that are different but subtly indicate gender if you’re really looking closely (the female’s hair is slightly different). The audience laughs because they understand that there’s no clear correct answer here, which was my intention. But the small clue that could indicate the female car (and it’s just a clue), which I would have never considered, I think makes the joke play even better. Because it lets the audience in on the joke. The art department understood what I was going for but had the difficult task of making it actually play – and what they came up with was better, in my opinion. Work like that takes more than just attention and care, it takes devotion. AV: Would you have examples of that connection between writing and art through your own experience? BQ: I cannot speak for the artists at Pixar as to what inspired them but the thing that sticks out for me is when Brian Fee (story artist) came onto the production. We’d been working the story for a little bit and having some trouble finding the right vibe for Mater. Brian worked on the first ‘Cars’ and has a lot of love and respect for the characters. His Mater drawings are so innocent and sweet. Your heart instantly goes out to him whenever Brian’s drawing him. That’s the image of Mater I have whenever I picture him in a situation: Brian’s eager, vulnerable, cute Mater. It helped me write him. From the point that Brian came on the movie – that’s when I started to love that character. AV: You wrote about “the symbiosis of form and content” (I love that one!). Can you tell me about that aspect of the movie? BQ: The nugget of the movie – what the movie is about – the ‘theme’ or whatever you want to call it, seems to inform everything at Pixar. John Lasseter makes sure everyone knows what the character is thinking at a particular moment and what that means to the story overall. And Harley Jessup, Sharon Calahan and others – they make their decisions based on what’s best for the emotional throughline of the movie. The colorscript, I think it’s called, is a good example of this. I’m sure you’re well aware of those. But the decisions about mood, lighting, color that informs those colorscripts come straight from that nugget. Anyone working on the movie should be able to stand in front of it and go “Yes, that’s how I’m supposed to feel the movie, emotionally”. AV: Obvisouly, screenwriting is pretty different from book writing. How would you explain those differences? AV: What aspect of the process of making Cars 2 did you discover thanks to the book you worked on? 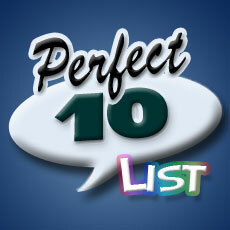 BQ: Just how many different skillsets these great artists must be proficient in. Jay Shuster, who designed Finn MacMissile, has an extensive background in industrial design. Harley Jessup was a visual effects guy who worked on some of my favorite movies from the late eighties and nineties. These guys are experienced. And they seem to draw on all of that. AV: How did you work with Karen Paik on the book? BQ: Karen did a ton of interviews. They were recorded and transcribed for me. I wrote a few drafts of the book and then we both did some more interviews. She had done other Pixar books, including ‘Art of’ ones and therefore knew questions to ask that I would not have. I couldn’t have done this without Karen. AV: In the book, you explain that it was a deleted scene in Cars that inspired the spy story of Cars 2. Now, do you see some deleted material in Cars 2 that would make a great start for a new story, some material you would have loved to develop? 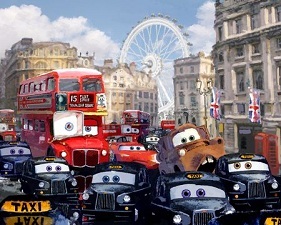 BQ: Cars 2 opens up a whole world for the Cars universe. It’s hard not to go poking your head around every corner and want to follow new characters and stories. Hopefully this world will continue to appeal to audiences and there will be time and enthusiasm to develop all the stories John and others here at Pixar want to explore.